This is one of those super-simple recipes that takes no time to put together, for sale but ends up looking and tasting absolutely amazing. You basically take a butterflied flank steak and load it up with baby spinach, feta cheese, marinated artichoke hearts, roasted garlic and capers. Roll it up and bake. Slice, sprinkle with a few mint leaves and that’s pretty much it. The stuffing is briny and super flavorful. It’s also quite pretty to serve to guests. Definitely one of my new favorites! Preheat the oven to 375°. Place the spinach, feta, artichoke hearts, capers and roast garlic in a bowl and mix until well combined. Set aside. Carefully butterfly your flank steak. I also pounded mine with a meat tenderizer to make it thinner, but that’s optional. Place the filling in an even layer over the steak, then carefully roll it tightly closed and secure the end with toothpicks. Place the roll seam-side down in a large baking dish. Bake for 25 – 30 minutes, depending on your preferred doneness and the thickness of your steak. Remove and let sit for 5 minutes, then cut into 4 sections, sprinkle with mint leaves and serve. I like that you cooked the steak medium rather than well done as flank steak tends to get very tough if cooked too much. 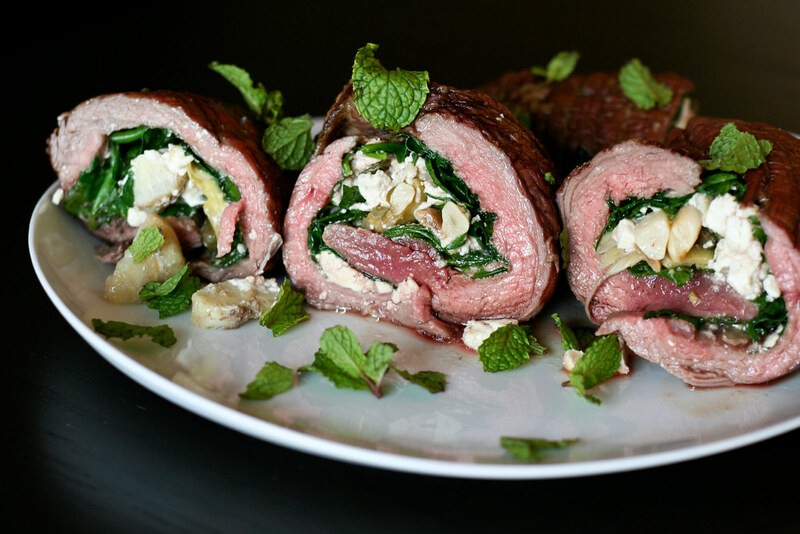 looks delish – any tips on how to butterfly a flank steak, haven’t had much luck with that task! lee – I would recommend doing it lengthwise and starting from the thickest part. Mine didn’t come out exactly even, so that’s why I pounded it with the meat tenderizer to get it more even. I made this for my family for new years – and they all loved it! It came out beautifully . Thanks for the recipe!